To remind yourself of all the wonderful things you have, at the end of each day take a few minutes to write down everything that you are grateful for in a diary or journal. It could be your health, a loving spouse, a beautiful home or a cup of hot cocoa. No matter how rough a day, there is always something or someone to be grateful for—a partner to come home to who will listen to you, a dog that adores you, a warm bed to sleep in or just that you survived that day with your limbs still intact. Gratitude has become truly rare. We live in a consumerist society in which only superlatives count. People quickly become dissatisfied with what they have, because there are always others who have more. The Law of Gratitude goes unfortunately completely lost in this Western mindset. It is a universal principle that if we practice this universal law, it brings very positive and rich results. The Law of Gratitude says, simply, that action and reaction are always equal and extend in opposite directions. A Grateful attitude is like a powerful force. If we allow ourselves to feel grateful about what we have, we will be rewarded in return. But if we are not grateful , discontent is pre-programmed and we will have bad experiences in our life. We automatically direct our attention to the deficiencies and lack. With a negative mindset, we will focus on the bad and on lack. If we focus on the deficiency of our life ,we program your brain to perceive only the discontent and attract it in your life and they give the received back tenfold. A person with a grateful mind, however, is confident to receive the best. A grateful person looks forward to the future and is ready to accept challenges and takes them positive as a way to grow. A thankful person will be rewarded every day andwill contribute to the wealth that surrounds us. Therefore, it is necessary to cultivate the feeling of gratitude and see all the good that we receive. It is not always easy to be grateful when there are failures and if we seem out of luck. But gratitude, happiness and success come together – are ONE. Gratitude is the most intense form of positive thinking, because gratitude takes nothing for granted. 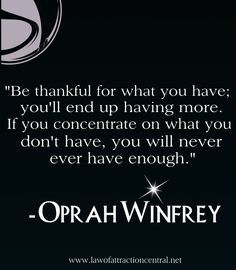 If you don’t take the time to be grateful you will never have more, and what you do have you will lose. Pretty strong and simple statement but this theory goes back thousands of years. It’s mentioned in the Bible, the Koran, Buddhism and even Tao – no matter what religion or if you are religious at all, thebelief is the same. This belief is a fundamental law of science and of the Universe. Gratitude operates through a Universal Law that governs your whole life. The Law of Attraction, which governs all the energy in ourUniverse, from the formation of an atom to the movement of the planets, like attracts like. In your life, this Universal law operates on your thoughts and feelings, because they are energy too, and so whatever you think, whatever you feel, you attract to you. If you think negative statements like: “I don’t like my job,” “I haven’t got enough money,” “I can’t pay my bills,” “My life is a mess” or anything negative then you will attract moreof those experiences But if you think about what you’re grateful for like, “I love my job,” “I had the best vacation,” “I feel amazing today,” and you will sincerely feel the gratitude, the law of attraction states you must attract more of those things into your life, like a metal that is made into a magnet, your gratitude becomes a magnet. We’ve all heard the sayings: “Whatever goes around comes around,” “You reap what you sow” and “you get what you give”. They are all expressing the same law and describing a principle of the Universe. If you believe in science, then you would know Sir Isaac Newtown. His scientific discovery concluded that the fundamental laws of motion in the Universe said: “Every action always has an opposite and equal reaction”. So if you mix spirituality and science you get the perfect ideal “Every action of giving thanks always causes an opposite reaction of receiving. What you receive will always be equal to the amount of gratitude you’ve given.” How perfect! Remember: The very action of gratitude sets off a reaction of receiving!